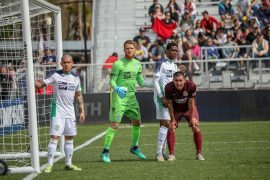 Starting goalkeeper Cody Laurendi was unable to make the trip to Sacramento with the rest of the squad, as the Puerto Rican national team called him up to start in their game against Grenada. Not only was his presence missed making saves between the sticks, but also the Oklahoma City defense was in shambles and looked disorganized all afternoon in his absence. Matters were made worse when starting center back Nicolas Taravel had to be subbed off as he was injured in the play that led to Sacramento’s penalty early in the first half. Not only did Garcia notch Oklahoma City’s only goal of the afternoon, but he put in a standout performance all day in the midfield. Under siege most of the afternoon, Garcia did a great job sitting in front of the Energy defense, winning the ball and transitioning play from defense to attack. For most of the game, if there was a positive offensive move from Oklahoma City, it almost assuredly saw Garcia in the middle of things, pulling the strings. A 4-1 scoreline at a glance could lead one to assume the Energy were run off the field in Sacramento. Oklahoma City will be able to build on this result knowing this was not the case. Forward Deshorn Brown had two great chances through on goal moments after Garcia’s breakthrough goal. In the second half, Oklahoma City also created a great chance off of a corner where midfielder Callum Ross found himself alone at the back post, but he was unable to direct the cross into the Sacramento net. Despite the lopsided result, Oklahoma City still created enough chances to find themselves in the game. If the Energy continue to generate these quality chances, along with the added stability of Laurendi’s impending return to the lineup, Oklahoma City should be able to ensure the result in Sacramento becomes an aberration instead of the norm.